The Maitland River Mouth must have one of the nicest unspoilt beaches in the country. This is a view looking toward the coastal suburb of Blue Horizon Bay, taken yesterday evening with oyster catchers feeding in the foreground. Judging from the signage at the parking lot this is about to change with some planned development. There are some places along our coastline that would be better served by leaving them unspoilt by development - this is one of them. ................. with one of the rusting steam engines at the Apple Express train graveyard. Staying with the airshow, there were two parachute drops at the airshow, in the course of the morning. The first team was the golden eagles, of the Police special task force. They jumped from a Spanish Casa, landing with pinpoint accuracy, right in front of the crowd. Later another team from EP Skydivers in Grahamstown jumped, and amongst their group was a tandem jump, with Crystal Watson. She is an amazing lady, director of the MTR Smit Childrens Haven, who care for mentally disabled children who have been removed from parental care. She organises these airshows to raise funds for the haven, and it is a HUGE task. .... for us, the highlight of any airshow is always the formation flying. Here the Silver Falcons in their Pilatus PC7 Mk11 Astras perform the final salute to end a stunning display of skill and teamwork. Yesterday was the day that aircraft fans in PE have been waiting for for the last 2 years. and big and little boys alike (and a fair smattering of girls too!!) descended on the airport to gasp and admire the big boys toys, and the skill of their operators. Well today is the PE airshow, and I am sure we will regale you with pix from that next week, but to set the scene, here is the tail and winglet livery of a South African Airways jet, taken as it taxied past at the last airshow in 2007. I wonder how many City Centres are so laid back that a dad can stroll with his son down the street like this! The houses running down the steep hill, to their right, are the back of the famous Donkin Terrace, which we have featured quite regularly. In front is the harbour breakwater with its warning beacon on the end. "Brian and I drove around on a Sunday evening, to see how our Council was contributing to the national effort to cut down on unnecessary use of power. Brian then sent these photos to our Councillor, Mr Slabbert, who agreed that it was terrible, and nothing more was done!" The other pictures are of the Eric Tindale building [and the one across the street, forgot its name] and the Eben Dönges building, the Dept of Roads and Transport, Telkom’s building near the City Hall and the NMMU North [? old Technikon]. Another guest photographer today..... This stunning photo was sent to us by Jan de Wet, who has spectacular views of the bay from his home. "I took the pic of the post office during a power outage in Richmond Hill(!) the owners of the building (South African Post Office) assured me that there were people working that night, however, I never told them that I have a 24-hour view of the building from my lounge and these lights have been on since Oct 2005 when we moved in!" So while Eskom begs all South Africans to save power, it appears that not all are as co-operative as others .... another prime example of citizens being asked to tighten their belts while politicians and bureaucrats continue to expand their own waistlines! In response to the pic we posted the other day, of the PE Airshow, we received this delightful image from our regular contributor, Louise. You've gotta admit, if they wanted to be cheap and sit outside the airport, watching the show for free, at least they did it with a certain style! If the current online petition to get the Manganese Ore Dump moved is successful, scenes like this will become a thing of the past. This is the loading jetty for the ore, and the large red ship is a bulk ore carrier. Hopefully our harbour area will soon be free of the pall of black dust that flies around whenever the wind blows........ and need I remind you that we have the nickname "the windy city"! It is always a pleasure to see the flamingos, as they return to the salt pans at Swartkops in spring. This year the numbers are still fairly low but hopefully more will arrive in the weeks ahead. The flamingos are quite shy and do not let one get too close for photogrphs, so you have to take what you can get. I strolled down to the bank in Rink Street this morning and took the opportunity to check out the upgrade of Parliament Street, which seems to be coming on quite nicely, with staff putting in extra time to get the job done. The street should be quite picturesque when complete, with the curved lamp poles and decorative balls along the pavement, though I suspect some unwary pedestrians may end up having bruised shins. Collin I hope you like what you see - it should soon be over. What a treat it is living in this town, on the days when the weather is perfect. There is nothing to match an evening strolling along beside the pier, or sitting at a beachfront restaurant, enjoying a meal, and watching the sun go down. This old house in Richmond Hill still has some of the original wooden fretwork on the eaves. The moon seems to echo the wooden ball on the finial. Yes, it's almost THAT time of the year again, when your intrepid bloggers arm themselves with cameras, spare batteries and memory cards, the video cam, and lots of suntan lotion, and spend a day of mindboggling fun, watching the aerial displays at the Port Elizabeth Airshow. It is taking place at the beachfront this year, on Saturday 25th October. As we get details, we'll let you know more, but this is just to whet your appetite.This is a formation turn by the Silver Falcons, taken at the 2006 Air Show. These came from a friend's garden (and if John of Sheffield, who sent us the wonderful vintage postcards recently, is reading this, the friend is Vilia, and I met your cousin at her (large number)th birthday party on Saturday, how's THAT for a small world!!!!) I just loved the way the early morning sun cast shadows on the wall behind them, creating a lovely warm abstract image. I love abstract photos, and it is always a dilemma deciding whether they are suitable for the Daily Photo blog. The rule of thumb we usually follow is that, if it could be anywhere on the planet, we put it on the personal blog, but if it is an unusual angle on something that is specifically found in PE we include it here. This wonderful wooden structure is to to found in StGeorges Park, covered in Wisteria. Richmond Park this evening, with the city lights giving the clouds a reddish sheen. Louise Eksteen took these photos from the second floor of the Humewood Police Station, overlooking the South End Graveyard. She asked if we know anything about this place.... we don't, do you? See anything odd about the building in this photo? During the World Cup Rugby, an ardent supporter of the South African team put the team's emblem on the roof! The springbok has been the emblem of South African Rugby as far back as I can remember (Ok Ok, I have the memory of a gnat, but still!) it seems the powers that be have decided this must change, and moves are afoot to change the emblem of the rugby team..... wonder if whoever put this one on the roof will remember to remove it....? A cold front swept through the Eastern Cape yesterday dumping some pretty extreme weather on the way. I must say, in all my years here, I don't ever remember it being so dark during the day that the street lights came back on! 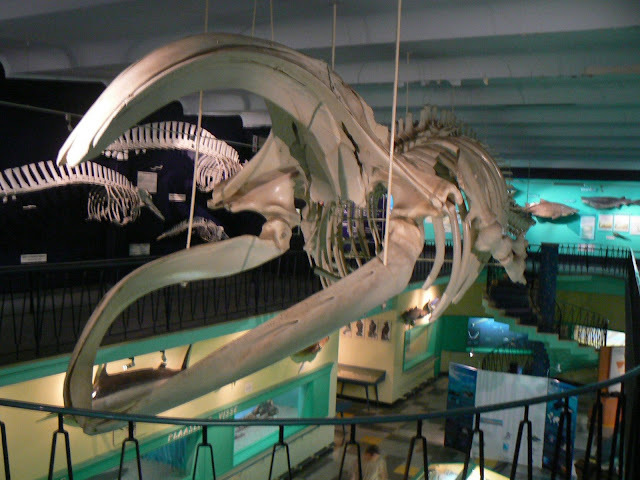 A whale skeleton at the Bayworld Museum. This used to be one of my favourite places to visit, and take our kids, as well as visiting neices and nephews. Unfortunately their shortsighted pricing policy now makes it a less attractive idea, and I know of lots of would-be visitors who no longer go there as a result. We went there recently to introduce our 4 year old grandson to the delights to be found there, but were told we had to pay to see the aquarium, reptile house, and the dolphin show as well, even though we did not want to see any of these. There was no way we wanted to pay 4 all that for a bunch of adults who have seen it all several times, just to do a quick round of the museum with the little guy, so we left. Another of the photos sent to us by Louise Eksteen last week, thanks Louise, its a nice alternative view of a PE icon! 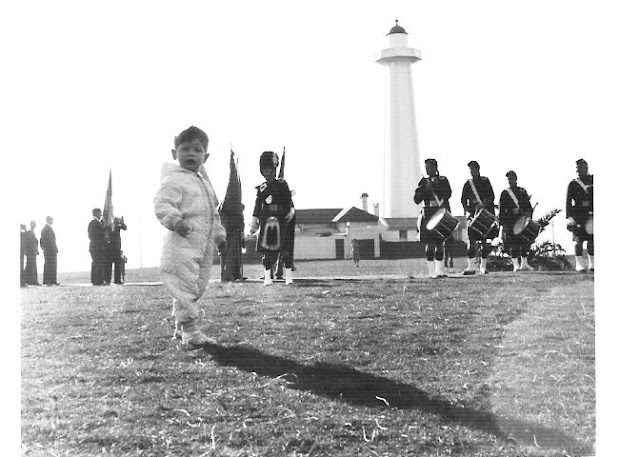 Our friend Gaston from France sent this photo of his son at the Donkin Reserve in 1960. I don't know what the occasion was but it looks interesting, can you just hear the skirling of the pipes? See what happens when you are sitting in the car, waiting for someone, and getting bored? This is a view of the parking area at Fiveways Spar, reflected in the doors of one of the satellite stores, through the glass balcony panel! The roof trusses for the new soccer stadium being assembled on site. They will be lifted into place with the huge crane featured in yesterday's post. A visit to the site of the new 2010 Soccer World Cup stadium shows that great progress is being made to get it completed before the event. The giant crane to the left will be used to lift the massive roof trusses in place. I am sure that many a good soccer game will be played here. The Hill Presbytarian Church, as seen from the Donkin Reserve, is one of the iconic symbols of Port Elizabeth. It features in many pictures of the city that have been taken from below the hill or from the sea, from the 19th century to current times. I was sruck by the similarity between this and yesterday's Donkin picture, both framed by tatty metal structures. Thanks for the pix Louise, no doubt we'll see you soon when something else happens in PE that we can't resist capturing for posterity!